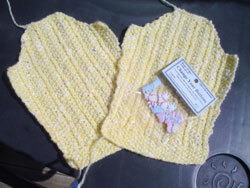 I finish baby Hannah’s sleeves (yes she was born on April 12). Fortunately the sweater is for 6 mos. so it’s not too late. Time to sew it together (ugh) and knit the neck band. The cute hands and feet in the package are the buttons. Due to a small error I will only be using 2. That is sooooo pretty and delicate. I just love baby knits! That is lovely,i dont mind sewing it up,i hate putting buttons on.